Thank you so much to the publisher for sending me a free digital copy for review via Edelweiss. Can’t Escape Love is number 3.5 in the Reluctant Royals series and I swear I just love this series so much! This instalment’s storyline happens parallel to A Duke by Default, so I recommend you read that one before you read this. Can’t Escape Love follows Reggie, Portia’s (ADbD’s heroine) nerdy, businesswoman sister, and puzzle-obsessed Gustave. Stress in Reggie’s life causes her to suffer with insomnia, and the only thing that helps her sleep is the sound of Gustave’s voice. Reggie and Gustave interacted on Gus’s livestreams years ago, and they reconnect and rekindle their feelings for each other in this nerdy, gorgeous romance. » The romance is so soft: like seriously, so soft. I loved Reggie and Gus together. They were both so loving and kind, and I loved seeing them bond over their mutual love for nerdy things. » Constantly challenging ableism. As you can tell from the cover, Reggie uses a wheelchair. There are numerous times throughout the book that her wheelchair and accessibility topics are explored, and I thought Cole tacked ableism very well. » So. Much. Nerdy. Stuff. I looooved seeing Reggie and Gus gush over what they’re passionate about and seeing them so unapologetically nerdy. Reggie runs a pop culture website called Girls With Glasses, loves anime, promotes an inclusive fandom environment. Gus is a puzzle lover who is building an anime inspired escape room. » The writing. As always, Alyssa Cole’s writing is light and fluffy, and addictive as hell. Her sexual scenes are always well written and her characters are just so relatable. » The escape room. Okay, so the novel sort of made the escape room out to be this big thing and then we don’t even really get to see the outcome of it???? I felt so much anticipation for it only to be let down. » Abrupt ending. Obviously I expect novellas to be a lot quicker and not as deeply developed as a full-length novel, but this one still felt really abrupt at the end. There was an exerpt of the final book in this series, A Prince on Paper at the end of this, and it took up 25%. So where I was reading, expecting to read 25% more, the book just ends. I would’ve liked a better ending with more of a lead up, but it was still good. Overall the Reluctant Royal series is such a solid, fun, cute romance series that I think I’ll be recommending for a long time! 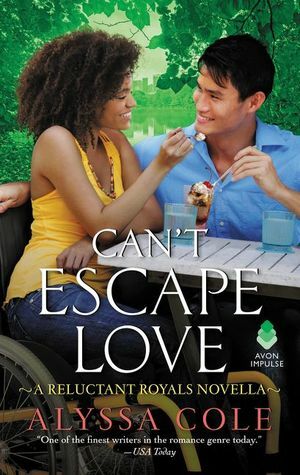 Can’t Escape Love was a great instalment to the series, and I’m always in awe at how well Alyssa Cole manages to balance out cute, fluffy romances whilst also dealing with such important topics. I’ve seen this novella around, but I wasn’t aware that it’s a Reluctant Royals novella! Great review, I love that the book discussed ableism and nerdy things!